Well, time is ticking on – we’re into June and summer is almost here (most days!) Plants are growing rapidly outside as they soak up the moisture from this wet spring. Of course, this means weeds too. Don’t forget that we have a good supply of shredded cedar mulch available. It’s naturally coloured and will fade over 2 or 3 years to a grey colour as it weathers and breaks down into the soil. 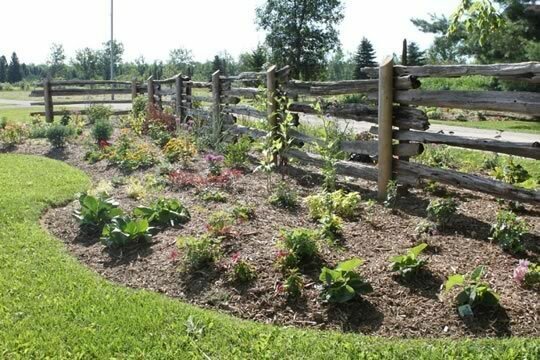 Mulch is great for spreading on your garden to help reduce weed growth and keep moisture in the ground. Our mulch is available in either small bags or bulk for pick up and delivery. Please contact us to set an appointment for loading or ordering delivery of bulk quanities. We have only 2 more weeks at the Creemore Farmers Market, although Dan will be there again in the summer and fall with his cut flowers, pumpkins and gourds. If you have not yet discovered this gem in our community, head on over. If you are a regular, Chris and our boys - Dan and Ben look forward to seeing you every week and thank you for supporting us – it’s a big job to select, load, set up, sell, load again and restock each week – in all weather! Sunday June 18th will be our last day open, so come by really soon. 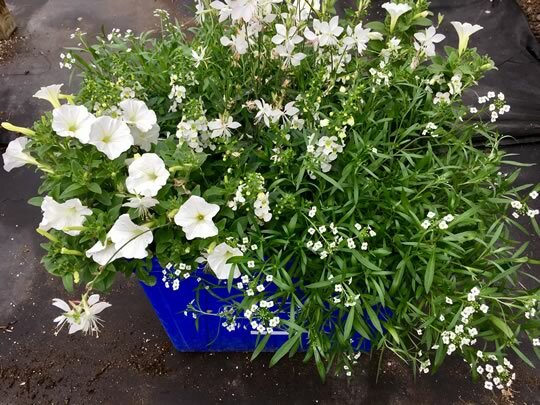 We still have a variety of plants to choose from, all in fabulous condition! 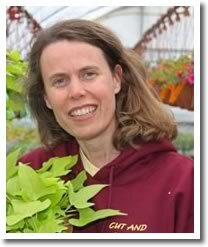 Gift certificates available – great idea for your favourite gardener! Just look at these gorgeous planters that are still looking for homes! We have these and many more still available. Although the names are a real mouthful (we prefer to call them Dippys and Mandys), these low maintenance annual tropical plants are absolute stunners. 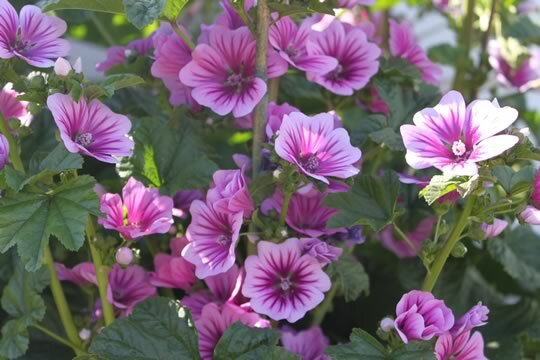 Their thick, glossy leaves mean that they are drought tolerant, love the heat and will thrive in a hot summer. 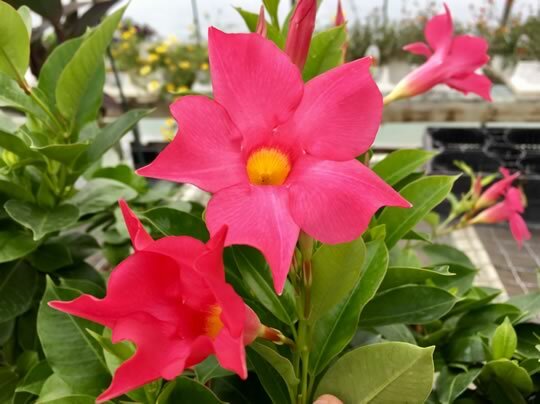 We have grown Dipladenia Summer Romance in red, pink and white. Plants form a small bush, growing up to 2 feet in height and are covered in large trumpet flowers all summer long. Mandevilla Dundee Pink is similar to the Dippys, although will vine and climb a little more – up to 4 feet in height. 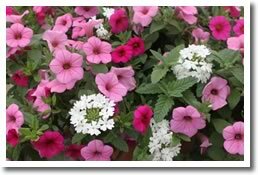 Use both types in the centre of planters as a ‘thriller’, or plant in the ground. Just give them 6 plus hours of sun a day and they will bloom non stop all season long. 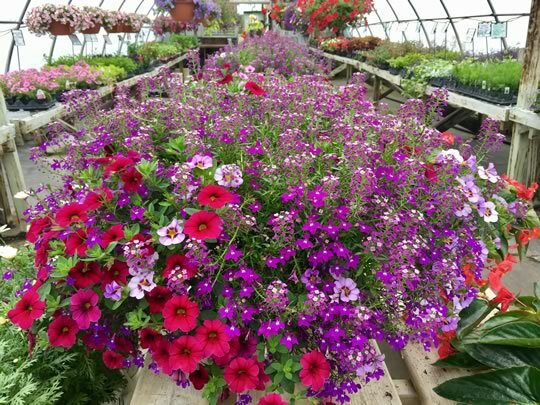 The fun doesn’t stop in the fall…both Dippys and Mandys can be successfully overwintered indoors. Before the frost arrives, bring them inside and grow in a sunny window through the winter. Keep on the dry side and do not fertilize. In the spring, enjoy again in your garden! Serviceberry (Amelanchier canadensis) is a native shrub that you will find growing in our countryside. It is also a wonderful large shrub for the garden, eventually growing to about 20’ high and 10’ wide. Each plant is multi stemmed and as the plant grows it develops into a beautiful airy architectural shape. Leaves are small and silvery green. In the spring for a week, or two at the most you will be treated to a covering of small white flowers. Birds love the fruit which ripens in the summer. In the fall, foliage turns brilliant gold. Serviceberry can look good planted singly as a specimen or in small groups. 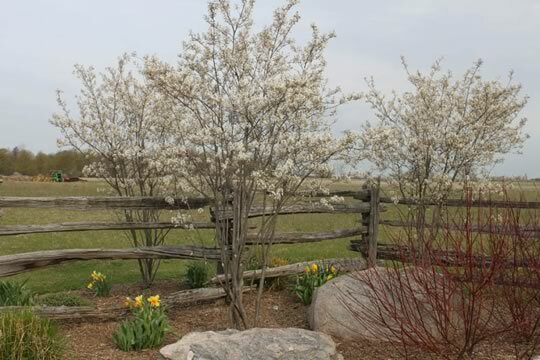 Next time you come into the farm, check out our Serviceberry in our entrance beds. They are the largest shrubs in the bed and look like bushy trees, anchoring the beds and providing year round interest. Our aptly named Buddleia or Butterfly Bush are just starting to come into bloom in our perennial house. 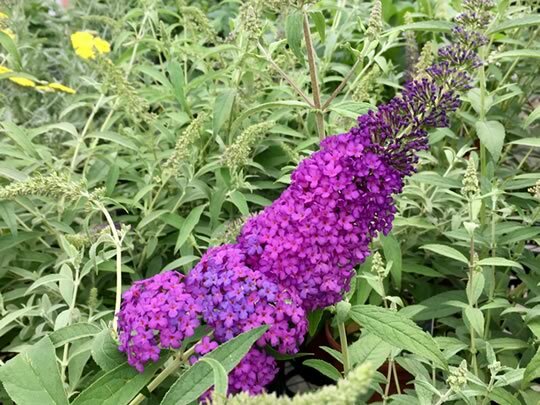 If you would like to try growing a real butterfly magnet plant and you have a sunny, sheltered location, then you must consider Buddleia! 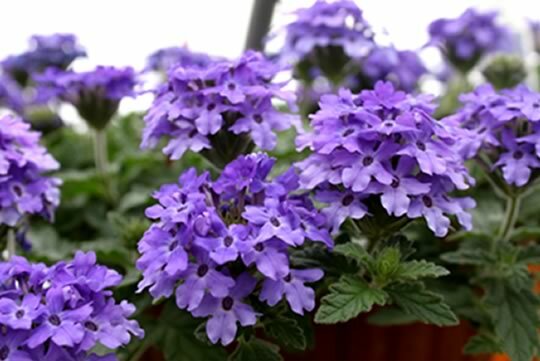 Choose from Prince Charming (cerise pink flowers) or Blue Knight (lavender purple flowers). Woody plants reach about 4 feet tall, with long flower panicles covering the foliage from late summer to fall. The scent is beautiful and the butterflies will flock to the blooms. Since these gorgeous perennials are a zone 5 plant, they need to be planted in a sheltered location, with some protection from winter winds. Do not cut back in the fall, instead cut back late spring when new growth is evident. Be patient – they can be slow to show signs of life in the spring. I’m adding some to my garden this year for sure! Habitat: Sun and shelter are important. Butterflies cannot fly in wind or rain and prefer sunny and calm or gently breezy weather. A wood or brush pile will give them a place to rest and hide. Plants: There are two groups of plants that will help attract butterflies. Plants that provide nectar as a food source and host plants that butterflies can lay eggs on. By planting a variety of these plants you can help attract and keep butterflies in your garden. Get the full list of nectar and host plants and make your garden butterfly friendly. We look forward to seeing you soon! Thank you so much for your continued business and support – it is our pleasure to be growing for you!